In October 2001 and July 2002, CT scans of the chest demonstrated progressive resolution of thickening in the right mainstem bronchus and marked improvement in right lower lobe airspace disease/atelectasis. 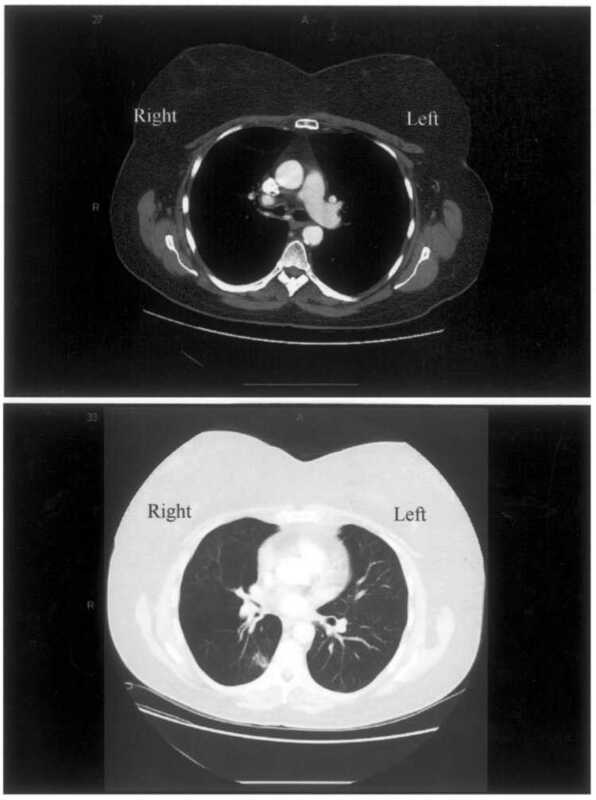 The most recent CT scan of the chest obtained in November 2002 revealed a continued improvement in the thickening of the right mainstem bronchus and near-complete resolution of right lower lobe atelectasis (Fig 4). The most recent pulmonary function tests were performed in December 2002 and demonstrated an FEV1 of 1.57 L (69% of predicted), FVC of 2.37 L (72% of predicted), FEV1/FVC ratio of 68%, and diffusing capacity of 13.23 mL/min/mm Hg (60% of predicted). The patient currently has minimal respiratory symptoms and has not required supplemental oxygen for the previous 7 months. The colchicine has been continued at a dose of 0.6 mg bid since diagnosis. TBA along with nodular and diffuse alveolar septal parenchymal involvement represent the three primary patterns of localized respiratory involvement. Within the subgroup of tracheobronchial amyloidosis, three primary distribution patterns exist: proximal, mid, and distal airway involvement. Localized TBA is thought to not be usually associated with systemic amyloidosis. Our patient demonstrated mid and distal airway involvement and has had no clinical or laboratory evidence of systemic amyloidosis. Figure 4. Follow-up CT scans after treatment revealed continued improvement in the thickening of the right mainstem bronchus and almost complete resolution of the right lower lobe atelectasis and the right pleural effusion.